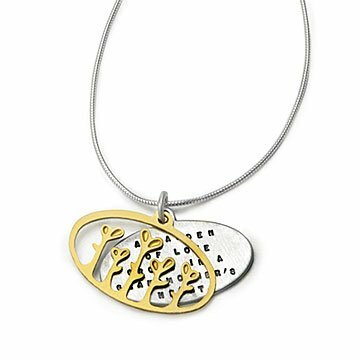 Honor a grandma who always gives her all with this poetic pendant by Kathy Bransfield. Celebrate a grandmother's love with this handmade pendant by Kathy Bransfield, featuring a sterling silver ovaL inscribed with a heartfelt line that honors a grandmother's special relationships with her family: "A garden of love grows in a grandmother's heart." A loose, 22 kt gold-plated brass overlay frames the message with a sweet vignette of new shoots, symbolizing love's promise of perpetual renewal. Handmade in California. Kathy Bransfield's early art career was full of "happy little trees." She started out standing in front of the TV and painting along with legendary television artist Bob Ross. Today, she creates meaningful gold and sterling silver jewelry. Each piece is a reflection of her complex character, revealing an organic sentiment and creating a modern day heirloom. The clasp was too small for a "grandma". There is nothing to improve on this necklace. A beautiful concept but a shame that the engraving is so small it can barely be read. My mother lived this necklace. She wears it everyday. Very unique and the message is heartwarming. My son's grandmother adores the necklace and pendent. The piece is smaller than I thought and thus lovely message VERY hard to read. Pretty but I was disappointed that the saying was stamped in the metal. It made it look a little cheap for the price I paid for it.